There’s something magical about those miniature bricks and studs; Lego transcends generations. 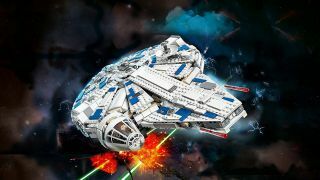 This is especially true when it recreates scenes from your favorite franchises, so we’ve pulled together the best Star Wars Lego sets you simply must own. Our team of Lego-loving fans have been sure to include kits from each era, too. Just remember, many of the best Star Wars Lego sets get updated from time to time. If one kit seems madly overpriced, it’s possible that a newer, cheaper version is available. This is very much the case with the Millenium Falcon, a bundle that’s been repackaged and remade more than a few times. For more goodness from a galaxy far, far away, don’t miss our guide to the best Star Wars t-shirts. You can also check out how to watch every Star Wars movie right here. One of the earliest Lego sets announced to tie into The Force Awakens, this model of Poe Dameron’s X-Wing is a great medium-sized kit, that’s a pretty impressive size despite only being 717 pieces. It cannot be denied that his classy ride is one of the *coolest* in the galaxy, and part of that is down to the sleek, chassi- wait, what am I saying? There are two reasons Poe’s X-Wing rocks: 1) it comes in his signature colours of orange and black and 2) it includes a BB-8 minifig that has his own seat behind Poe. Oh, sorry, there’s a 3) the Poe minifig has stubble. No, I’m serious. The allure of some Star Wars Lego kits is quite simple: you’ve seen the movie, and fancy recreating a scene and perhaps tweaking a detail or two (Kylo Ren being permanently shirtless, for example). The nifty thing about this set is that its on-screen equivalent hasn’t yet featured in any of the live-action films, but instead, debuted in The Clone Wars TV show. The set includes both a Yoda and R2-D2 minifig, and the best part - the actual Starfighter which has folding wings, spring-loaded shooters, and a couple of laser cannons for good measure. This might work well alongside Poe’s X-Wing, as a 'fantasy Force' type of Rebellion fleet. Just sayin’. The final instalment in the original trilogy remains a little hit and miss for fans. Don’t let that spoil the best part of the movie - the Battle of Endor, which inspired this Scout Trooper and Speeder Bike set. What’s most intriguing about it is the decision to do away with the typical minifigure and to instead pop in a large-scale figurine. While many larger figs are a bit of a disappointment, the Scout Trooper is an exception, making this a must-have set. Well, the speeder bike is a blast too, fitted with arm and foot rests for the Trooper and a couple of spring-loaded shooters. Arguably the coolest character in Solo: A Star Wars Story - after Han, of course - is Enfys Nest. Sure, her intentions aren’t clear, but that doesn’t detract from her badassery, especially when she’s cruising on her swoop bike and making life difficult for Tobias Beckett. This brand spankin’ new Lego set is inspired by their tussle, and while not a mammoth build, it features two detailed swoop bikes for construction. If that wasn’t enticing enough, this battle scene comes with a series of minifigs including Enfys Nest, Weazel - both of whom snap into the cockpits! - and Beckett. It’s obviously up to you who makes away with the coaxium. Is Krennic the biggest douche in Rogue One? Most likely, yes. That doesn’t make building his Imperial Shuttle any less fun though. This monstrous set will have you soon wondering where the hours have gone, as the pile of bricks quickly comes to resemble Krennic’s ship with its unusual design… a bit like its owner, then. According to Star Wars lore, he selected the ship due to his love of unusual geometry, which is perhaps the most random piece of Star Wars trivia I’ve ever heard. In any case, this looks super sleek once you’ve got it assembled, featuring folding wings, side-armored panels, and an opening front. it comes complete with a decent haul of minifigs too including Krennic, a K-2S0 droid, two Imperial Death Troopers, Pao, and Bodhi Rook. With a solid 4.5-star rating on Amazon from over 300 customers, the AT-ST walker is a solid bet for your Lego collection. It’s hard to imagine even having a Star Wars Lego collection without one of these towering all-terrain vehicles. Where the Resistance has their iconic transport - the X-Wing - the Empire’s unmistakable two-legged creation might not be as well known as the bigger AT-AT but damn this set is just as much fun to build. The kit comes with a Rebel Trooper, Baze Malbus and a AT-ST driver minifig, and clocks in at 449 pieces, making it a fun construction that won’t take days to complete. Hurrah! Just try and tell me you don't hear THAT theme play in your head as soon as you see this set. Capturing the now-iconic battle between Darth Maul, Obi-Wan Kenobi, and Qui-Gon Jinn, it's a wicked little set that's also very affordable. While he’s a rather mixed-up fellow, on account of having (SPOILER ALERT!) murdered his own dad and now having second thoughts about his future as the leader of the Evil Empire, Kylo Ren’s got a lot on his mind. What he doesn’t have to worry about is how he’s gonna blast away at the Resistance, due to his uber-badass TIE fighter craft, that’s one of the very best Lego sets from The Last Jedi. At 630 pieces, it’s a decent-length build, that looks top notch when complete, what with its red-tinted cockpit windows (well, he *is* evil) and trigger-activated spring shooters, you can’t really grumble! Spritely, fast, and cheap. That sums up Rey’s speeder and this nifty, well-loved Lego kit. If you’re after a simple set that’s easy to put together and looks great on the shelf alongside your AT-AT bookends, then this is for you. Rey’s beat-up mode of transport debuts in The Force Awakens, where she putters across Jakku on it, scuttling away whatever she scavenges inside its storage compartment. Lucky for you, this Lego set is a loyal recreation of that clunky ride. It includes a storage hatch to hide away your tiny treasures along with a side-mounted bag, blaster, buzzsaw and electrobinoculars. Oh, and a Rey minifig too. Well, who’d drive it? Starfighters, X-wings, freighters, shuttles - they all lend themselves to the Lego treatment. This set, one of a new batch recently announced, does away with all that. This badboy gives you the chance to encounter the medical facilities of a galaxy far, far away. Heck, the tagline is “Save Luke Skywalker! Rush him to the Hoth Medical Center for treatment!” It’s one of the more unusual builds out there, hence its huge appeal. Based around The Empire Strikes Back, it has a load of fun, playable features once you’re all set up, including a rotating examination chair, a bed, a chair, and a, uh, wash station. Alright, so it’s a Lego hospital. But this is STILL Star Wars: it also comes with a medical assistance droid! While brown isn’t the most glamourous of colours, bringing to mind things like mud and stick insects, when we’re talking about the gigantic Sandcrawlers, it doesn’t really matter. See, that’s what makes this immense Lego kit so much fun - its simplicity. This is a big brown tank with droids and Jawas. What’s not to love? Normally seen attempting to make their way across the impenetrable dunes of Tatooine, this kit makes for a really fun day of construction. At over 1000 pieces, it may take you a while. What order should you watch the Star Wars movies in? Despite having hardly any screentime whatsoever in the original trilogy, Fett is now getting his own spin-off and who knows how many more sequels down the line. Interestingly, Fett’s Slave I ship is just as iconic as the bit player himself, hence it receiving the Lego treatment. This model ain’t no half-hour job, either. It comes with 1996 pieces! In fact, of all the Star Wars Lego sets out there, this is one of the more ambitious, and feels surprisingly hefty once completed. Plus, with its red and green bricks, it looks impressive as all get-out, especially compared to most black and grey Lego kits in the Star Wars universe. Okay, okay, so maybe I was wrong before when I said the best part of Jedi was the Battle of Endor. This kit includes everything you need to recreate one of the movie’s best scenes - the final confrontation between Luke, Darth Vader and Emperor Palpatine. For saying it’s not a massive set (724 pieces), it’s packed with loads of cool features that make it one of the most endlessly playable sets, instead of being static once complete. The throne room actually opens out, which is a nice touch, letting all five minifigs into the space. There’s a Force jump function for Luke, collapsing stairs and bridge, and a lovely shaft for you to push Palpatine down. To coincide with the recent release of Solo: A Star Wars Story, Lego issued a brand new version of the Millennium Falcon. Known as the Kessel Run edition, this set of bricks is undoubtedly the same ship we know and love, yet its much fresher and new. That’ll be on account of Han not having battered the crap out of it during the Kessel Run. Marvel at the bright colours - the bricks for the main body of the ship are white, not grey like the 75105 The Force Awakens version - and the spot where the escape pod sits. young Han, Chewie, Qi’ra, young Lando Calrissian, Quay Tolsite and a Kessel Operations Droid, plus a DD-BD droid.